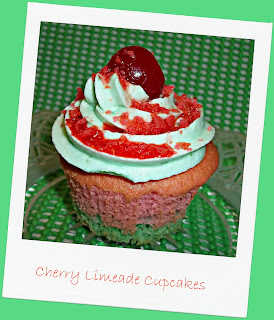 FoodThoughtsOfaChefWannabe: Your favorite summer drink, in a cupcake! Your favorite summer drink, in a cupcake! So, you DID listen to me and you did come over for this one eh? Cool, glad you did. This may seem like a regular cupcake recipe but it has a fun twist and when you see what it is, you are going to think to yourself, "COOL"! If you have a child celebrating a birthday soon, don't order cupcakes, make these! Let me get on to gettin' on so you can find out, I possibly hit this one out of the park. Well, you all know how I feel about box cake mixes. And to be honest, I swear I was going to use a from scratch recipe today. When at the last minute I decided to divide my batter, I decided I was going with a box. You will see why. I just want it to be noted, I DID plan on making cake from scratch. Even fate thinks I am better off with the box! Cherry limeades are possibly my second most favorite drink, especially in the summer. My husband so kindly brought me one a week or so ago and with my unwavering love of cupcakes I thought I should probably try to put this drink, in a cupcake. I did it, I really did it. AND, to top it off, literally, you get a sweet little cherry, and POP ROCKS! I wanted to be able to give you that fizzy in your mouth like a limeade that is carbonated and what better way? It beat out the idea of just having you pour baking soda and vinegar with a shot of lime down your throat. Better choice, don't you think? Mix cake according to package directions EXCEPT, leave out the water it calls for. At this point divide into 2 bowls. Bowl 1 gets, half the amount of water called for, 3-5 drops of red food coloring and 3 tsp cherry flavor. Mix completely. ﻿Bowl 2 gets, zest of one lime, juice from 2 limes into a measuring cup. Whatever the difference is between the lime juice and half of the measurement needed for water, make up with water added to your lime juice. Also add 3-5 drops of green food coloring. Add green batter to the bottoms of all the liners, about 1 1/2 tbsp, and then add the red/pink batter on top. You want to make it so this fills the cupcake up 2/3 of the way. I got 18 cupcakes, but I think you should easily get 20. I overfilled a handful of them. Bake according to package directions, they are done when a toothpick inserted, comes out clean. Let cool completely. While you are letting them cool, lets get started on the icing! Combine all ingredients with a hand mixer or stand mixer. Mix until completely smooth and all food coloring is mixed in. I used a piping back, and piped the icing on the cupcakes. Top with a maraschino cherry, and cherry pop rocks. If you want, RIGHT before serving you can drizzle a tiny bit of cherry juice over the top to get the rocks crackling while serving! These are so fun!! You will be a rock star if you serve these to a bunch of kids OR adults! We are going to be making these in this house for sure!